If there’s one thing that’s true about being an online retailer, it’s that you go through an incredible amount packaging material. That’s always been a sore spot for us here at HVACquick, considering our commitment to being as environmentally friendly as possible—it’s more likely than not all that packaging ends up in a landfill somewhere. It’s something of a comfort that cardboard boxes are actually pretty green (since so much of them come from recycled paper), but still, we can’t afford (as either a business or as environmental citizens) to be constantly replacing products damaged in transit to our customers. Thus, every day, we use a huge amount of bubble wrap and similar padding, which generally cannot be recycled. 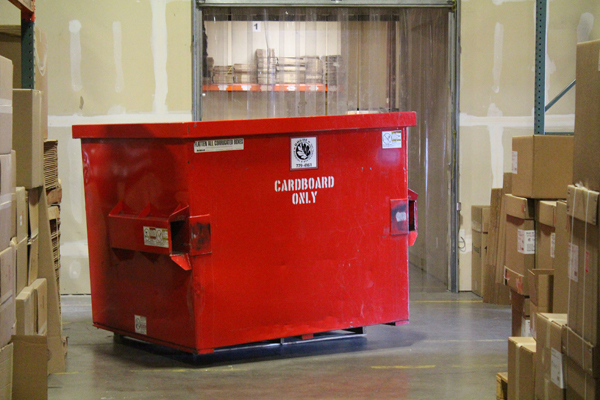 Given how much packaging we go through, you might expect our dumpster to be pretty big as well. It is not. We use only the smallest-sized commercial garbage dumpster; our commingled recycling dumpster is quite a bit larger, and our dedicated cardboard dumpster is even larger yet. We send approximately 7 cubic yards of cardboard to the recyclers every week. To get an idea of just how big a volume this is, consider that the largest residential garbage collection in our area (and probably in yours) is 96 gallons. That’s slightly less than 1/2 of a cubic yard, or less than 1/14th the volume of our cardboard dumpster! We’re much happier to be recycling all that cardboard than sending to the dump, but, according to the Three R’s, it would be better for us to reduce that amount or find a way to reuse it. Almost all our waste cardboard comes from the boxes of items sent to us, which means we can’t easily “reduce” its volume, and we can’t send our customers their purchases in reused boxes, so recycling has always seemed the best we could do. It was an interesting day in the office, then, when one of our engineers ran the numbers and figured out we recycle a greater volume of cardboard each week than we use of bubble wrap. If only there were a way to turn our waste cardboard into something we could use in place of bubble wrap . . . . It turns out there is! 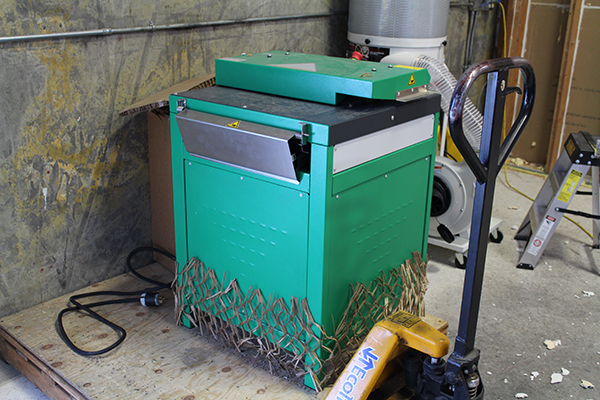 A number of companies manufacture shredders that can turn flat sheets of cardboard into packaging fill. We’ve recently invested in one, and are beginning to “reuse” our waste cardboard boxes by turning them into a substitute for bubble wrap. The advantages to this are almost too many to name here. Firstly, we’re saving money by no longer needing to pay for so much bubble wrap or cardboard disposal. Secondly, we’re replacing bubble wrap with something more environmentally sound. The paper in cardboard ultimately comes from trees, which are not only a renewable resource, but consume carbon as they grow. On the other hand, the plastic out of which bubble wrap is made comes from dirty petrochemicals (BAD!). Finally, once our customers have received their packages, the cardboard can be easily recycled, whereas bubble wrap cannot. We’re very excited about this new development and hope you are as well. 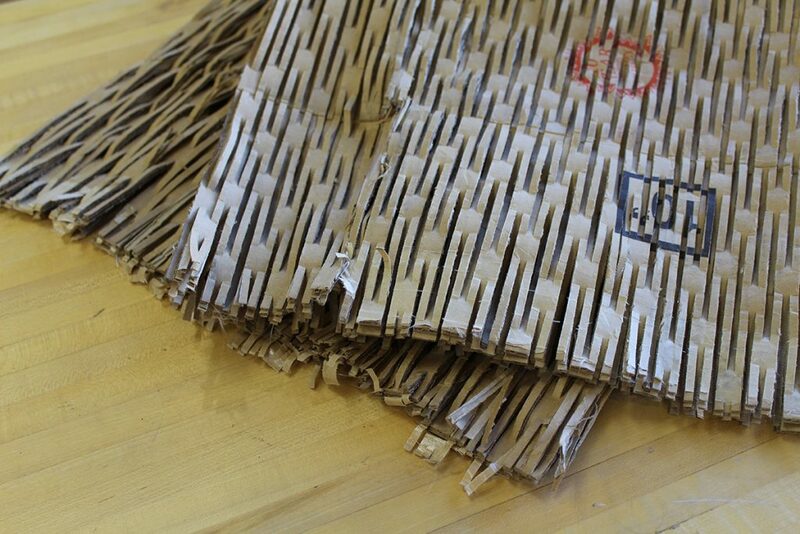 When you receive your first package with our new cardboard fill material, please make sure to reuse it in your own shipments or recycle it at your local recycling center.